Our new logo by Sudbury designer Bethany Schlegel Shaw is stylized image of the Loring Parsonage where our new History Center will be located. The colors incorporate various structural components of this almost 300 year old building. The Loring Parsonage in caricature signifies looking at history from a modern perspective, which is at the core of the SHS mission. For many years our logo wass based on the Portico Lantern which hangs over the front door of Town Hall where we are located. The lantern was given to the town in 1914 by the Goodman Society in 1914 and is based on a design by renowned Sudbury architect Ralph Adams Cram. The lantern originally hung in front of the original Town Hall which burnt in 1930. The logo of our predecessor – The Goodman Society – incorporates a stylized portrait of Cato, the Native American who sold the land to the original settlers of the Plantation. Cato was given the title and rank “Goodman” by the colonials. He and his family lived on what is now called “Goodman's Hill”. The Sudbury Historical Society is dedicated to bringing the rich history of the Sudbury Plantation into the lives and activities of the people of Sudbury. A non-profit organization, the society depends on donations of time, money and artifacts from our members, citizens and businesses in Sudbury, and Sudbury-minded people around the country. The Society was founded in 1956 by history-minded citizens of Sudbury. In 1970, it absorbed the Goodman Society (founded in 1890) its predecessor Historical and Improvement Society. 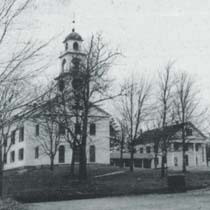 Since 1998, thanks to the generosity of the town's selectman, the Society has been headquartered in the Second Floor of the Sudbury Town Hall. In 2017, the Society will start to move next door to the Loring Parsonage where it will operate the new Sudbury History Center. Educate and interest the citizens of Sudbury in a finer public spirit, through understanding of the traditions and history of the town. Collect, study and conserve artifacts and records relating to the history of Sudbury and its people. Provide public programs and events relevant to the local history of Sudbury. Provide age appropriate educational materials, research and tours related to the town's history for the town's children and students. Assist anyone looking for information on Sudbury history. Support academic research into the history of the town. The Society is a charitable, educational institution incorporated in 1956 as a Chapter 501.3c nonprofit corporation.